Throughout our country’s history, the National Mall in Washington, DC, has played a prominent role as a venue to inspire, celebrate, recreate, demonstrate, protest, and petition the government for redress of grievances as envisioned in the First Amendment to the Constitution. No wonder the Mall has been called the Stage for American Democracy. And no wonder 25 million people, local residents and visitors from around the country and the world, come to see and enjoy the Mall’s extraordinary museums and monuments. Welcome to the National Mall, one and all. The Mall and the museums and monuments that line it have a proud association with science, the arts, culture, history, exploration, the environment, and more, examining their vital roles in American life. To help orient you, here’s a map and historical guide. Learn more about our nation’s history in this downloadable, tri-fold, self-guided tour of the memorials, America’s Struggle for Freedom. The Mall owes its existence to George Washington, who conceived the idea in the context of his training as a land surveyor. His vision was translated into a detailed plan by French architect/engineer Peter (Pierre) Charles L’Enfant. Long before there was a Mall, a Washington, or a United States, many America’s indigenous nations made and used sophisticated astronomical observations and were served by experts in botany, agriculture, and hydrology. 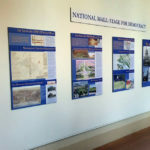 Many of their achievements are on exhibit at the National Museum of the American Indian on the southeast edge of the Mall. Next door to the Museum of the American Indian, the National Air and Space Museum exhibits and celebrates the sciences of aviation, astronomy, and space exploration both by the U.S. and by other nations. Other Mall museums created and maintained by the Smithsonian Institution, a federally chartered organization founded by the chemist and mineralogist James Smithson, preserve and interpret the record of scientific and historical achievements. The National Museum of Natural History focuses on geology, geography, hydrology, oceanography and the biological sciences as well as anthropology archaeology, and interdisciplinary environmental studies. The National Museum of American History celebrates American accomplishments in engineering, applied sciences, and many other spheres. The newly-opened National Museum of African-American History and Culture commemorates and interprets the many contributions of America’s citizens of African descent. A current exhibit highlights the roles played by Islam in the lives of African-Americans, notably those brought to this continent in enslavement. And, of course, the National Gallery of Art, the Hirshhorn, the Sackler, and other museums showcase some of the most outstanding works of art by artists from this country and around the world. The contemporary Mall and its managers face many practical challenges, not the least being the Mall’s very popularity as a stage for democracy, freedom, equality, and justice. Traffic and parking management and air pollution have become serious problems. Flooding, too, is a likely threat, which may be exacerbated by climate change, including rising sea levels, and more intense storms. Solutions to these and other challenges demand a new vision for the Mall’s 3rd Century. The National Mall Coalition has long advocated for a new comprehensive plan for the Mall; the last one dates to 1902. Central to achieving this vision is to get the numerous agencies and congressional committees that have say in Mall planning and activities to come together and find a unified voice. The Coalition also has developed a proposal for the National Mall Underground to handle bus parking, to build a cistern to absorb flood waters as needed, to generate geo-thermal energy, and to provide a visitor center and other amenities. The proposal awaits a feasibility study by the U.S. Army Corps of Engineers in cooperation with the District of Columbia government. All around you, as you gather on the Mall, you will see displays and exhibits showcasing American history and Americans’ contributions to understanding and exploring the world around us. Today, you, too, are making history. Welcome to the National Mall!